A tailor-made experience that will allow you to live an unforgettable day in the canton of Friborg. In order to fully enjoy your excursion in peace, we offer you a 50% discount on your public transport journey with the FAIRTIQ application on the entire Swiss network. Insert the code received directly on the FAIRTIQ application. DEPARTURE from your home by public transport, direction Bulle and Montbovon station where a van will be waiting for you to go to Gruyère Escapade. BACK to your home by public transport. 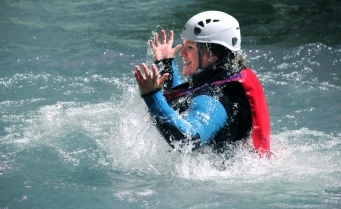 You’ll start your day with canyoning along the easy La Tine route, where the emphasis is very much on having fun with jumps, a zipline and white-water swimming. Excitement guaranteed! After your adventure in Montbovon, it's back to Bulle and the Gare à toi bar, just around the corner from the station. You'll enjoy a drink (a glass of white wine, a craft beer on draught or a soft drink) and a tasty Flammenküche – the perfect end to an afternoon of thrills and spills. It's the ideal place to relax before a hearty meal. 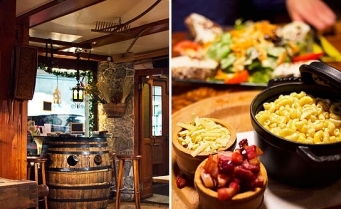 The day ends in style in the rustic setting of Bulle's La Cabriolle restaurant, where you'll tuck into a delicious Swiss fondue of regional cheeses (200 grams). Follow our influencers and win tickets for two for this offer!